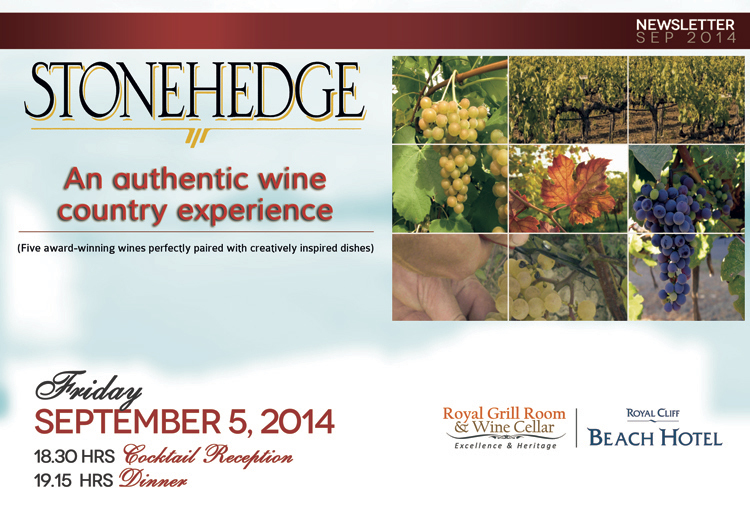 Royal Cliff Hotels Group invites you to experience quality wines from Stonehedge Napa Valley on our next DeVine Club wine dinner due to take place on Friday, September 5, 2014. As an excellent opportunity to come together and enjoy great company along with excellent food & wine pairings created by our award-winning culinary team, our wine dinners have been a resounding success throughout the years. We take great pride in receiving once again the Wine Spectator Award of Excellence 2014 that reinforces the quality of our wine list and the finest food that we serve. All guests and deVine Club members will have the wonderful opportunity to taste and experience the variety and richness of California Wines together with a delectable 5-course dinner at the Royal Grill Room & Wine Cellar of the Royal Cliff Beach Hotel. Four lucky winners will also be chosen during the dinner's raffle draw to win one of the evening's special wines. With our upcoming event, "Stonehedge Napa Valley: A Unique Wine Country Experience", wine lovers will have the wonderful chance to enjoy the excellent 5-course dinner at the Royal Grill Room & Wine Cellar The evening will commence with a cocktail reception at The Bar of the Royal Cliff Beach Hotel at 18:30 hrs. Dinner will be served at 19:15 p.m.
Join us in this enjoyable and informative evening showcasing the distinctiveness of California wines together with our esteemed wine specialist and guest speaker, the President and CEO of Smith-Anderson Wine Group, Mr. Shahin Shahabi. 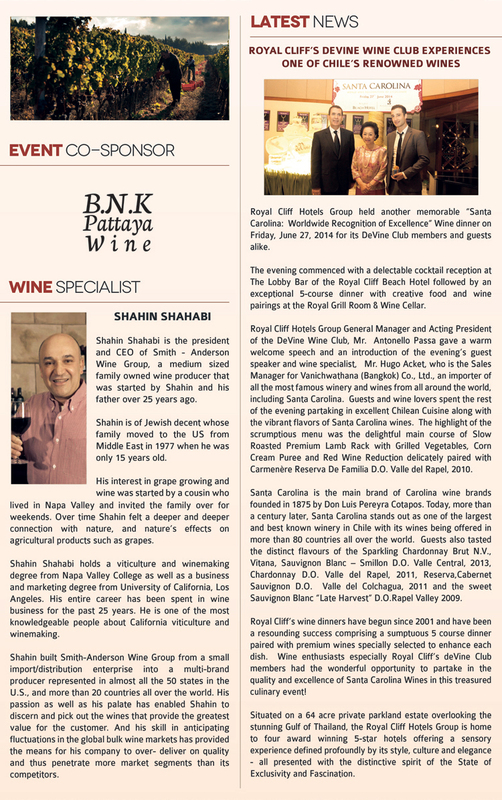 Mr. Shahabi holds a viticulture and winemaking degree from Napa Valley College as well as a business and marketing degree from University of California, Los Angeles. His entire career has been spent in wine business for the past 25 years and is one of the most knowledgeable people about California viticulture and winemaking. Napa Valley is the most famous and the most premium region in California for growing grapes and making wine. Since its wineries Napa Valley debut in the early 90s, Stonehedge has consistently received high critical accolades and sustained press coverage. From major wine publications to major metropolitan newspapers, Stonehedge is highly praised and often touted as the wine to be discovered. 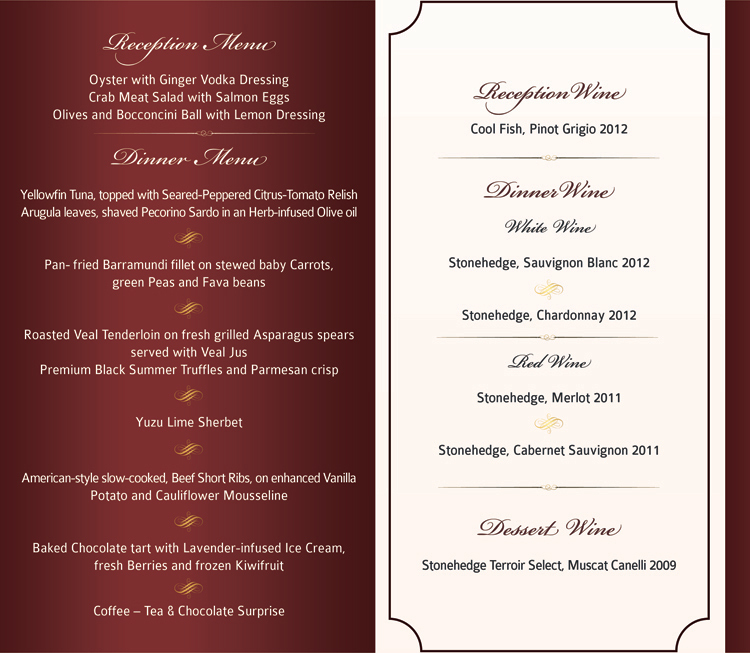 I am sure that this wine dinner will be another unforgettable night for all of us. Please make your reservations early as seating will be limited. We look forward to welcoming you again to this prestigious evening.